[Season 2] plunges you into a world torn apart by a virulent plague. Those who remain in this post-apocalyptic setting cluster in the few remaining cities, barely eking out an existence. In this harsh environment, antibiotics, food, medicine, tools, and other supplies are precious commodities. […] Only nine cities are on your grid at the beginning of the game, but the tantalizing possibilities of what lies beyond are on full display. Once you have established the appropriate infrastructure in select cities across the map, you can begin to explore some of the lost world by taking the Recon action. As with Season 1, the game will come in two box colors, but the contents of each will be identical. 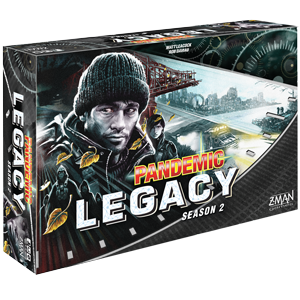 For 2-4 players, Pandemic Legacy: Season 2 looks to arrive late in Q4 2017.